The state of Arizona has a grandparents’ rights law in effect that permits grandparents to obtain visitation rights, even over the objections of the child’s parents. Nevertheless, it can be a difficult hurdle to clear. That is why it is vital that grandparents seeking visitation rights consult with the experienced and compassionate Tucson grandparents’ rights attorneys at Dorris Law Group for a no-cost, no-obligation consultation today to learn how we can help them get their grandchildren back in their lives. The closeness of the relationship between the grandparent and child. The reasons the grandparent is seeking visitation rights. Any justification in the parent denying visitation. The length of visitation being sought by the grandparent. The potential impact granting visitation rights could have on the child’s life and other activities. If you’re a grandparent in Arizona seeking visitation rights, contact the grandparents’ visitation rights attorneys at Dorris Law Group. In addition to our other family law services, we are the expert guidance you’ve been looking for with regard to your visitation rights. 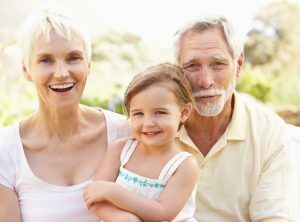 If both parents are deceased, or have otherwise relinquished custody, grandparents have the right to pursue child custody and adopt their grandchild, provided they meet Arizona’s adoption criteria. Generally, the grandparent in such a case will first have temporary child custody and then seek a full adoption. Parental rights are recognized as constitutional ones. There is a presumption that it is in the child’s best interests to remain with his or her legal parent. However, in some instances, grandparents are able to obtain custody even when one, or both, of the child’s parents are living and objecting. In family court, the grandparent must be able to prove by clear and convincing evidence that it would be significantly detrimental to the child to remain in the parent’s custody. Grandparents seeking custody over parental objections must prove that they have been providing care to the child and it is not in the best interests of the child to remain in the parent’s custody. Among the factors the court will consider are the wishes of the child and the child’s parent, the part the grandparents and parents play in the child’s life, potential environmental adjustments, the health of the parties, who is most likely to cooperate in ensuring contact between all the parties, and who has provided primary care of the child. Overcoming this presumption requires much work and great skill. Our team of family law experts have the skills necessary to assist you in your case. A grandparents’ rights lawyer at Dorris Law Group will put together the most compelling case possible to protect the best interests of your grandchild. Contact us online or call 520-622-4866 today for your no-cost, no-obligation consultation.